Multilayer stretchable electronics; optoelectronic fibers; Li-metal ceramic electrolyte. Researchers at UC San Diego, the University of Electronic Science and Technology of China, and the Air Force Research Laboratory developed an approach to creating stacked, stretchable electronics with complex functionality. 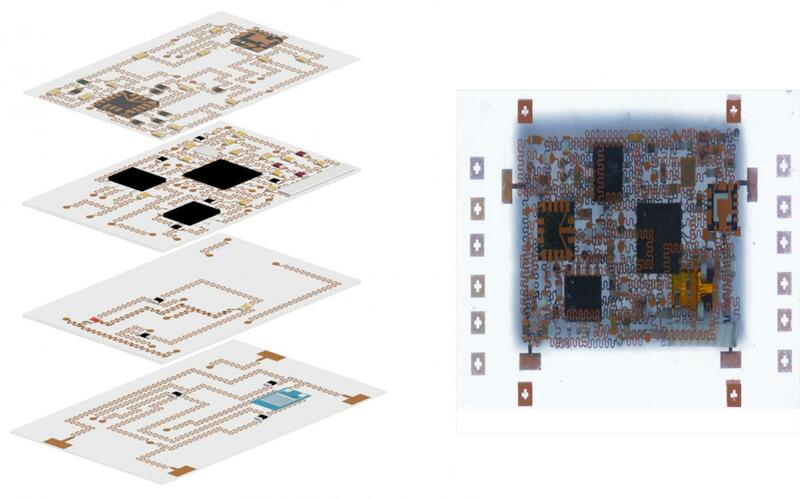 “Rigid electronics can offer a lot of functionality on a small footprint–they can easily be manufactured with as many as 50 layers of circuits that are all intricately connected, with a lot of chips and components packed densely inside. Our goal is to achieve that with stretchable electronics,” said Sheng Xu, a professor in UC San Diego’s Department of NanoEngineering and the Center for Wearable Sensors. As a proof of concept, the team built a stretchable electronic patch that can be worn on the skin like a bandage and used to wirelessly monitor a variety of physical and electrical signals, from respiration, to body motion, to temperature, to eye movement, to heart and brain activity. The device, which is as small and thick as a U.S. dollar coin, can also be used to wirelessly control a robotic arm. The new ‘smart bandage’ device consists of four layers of interconnected stretchable, flexible circuit boards. Each layer is built on a silicone elastomer substrate patterned with an “island-bridge” design. Each island is a small, rigid electronic part (sensor, antenna, Bluetooth chip, amplifier, accelerometer, resistor, capacitor, inductor, etc.) that’s attached to the elastomer. The islands are connected by stretchy bridges made of thin, spring-shaped copper wires, allowing the circuits to stretch, bend and twist without compromising electronic function. A major difficulty in building stacked, flexible electronics lies in creating the vias. Traditional lithography and etch don’t work on stretchable elastomers. Instead, the team used lasers to create them. First, the team mixed silicone elastomer with a black organic dye so that it could absorb energy from a laser beam. Then they fashioned circuits onto each layer of elastomer, stacked them, and then hit certain spots with a laser beam to create the vias. Afterward, the researchers filled in the vias with conductive materials to electrically connect the layers to one another. And a benefit of using lasers, notes Xu, is that they are widely used in industry, so the barrier to transfer this technology is low. The team intentionally added an array of functionality to the proof-of-concept device. “This device is like a ‘master of all trades.’ We picked high quality, robust subcomponents–the best strain sensor we could find on the market, the most sensitive accelerometer, the most reliable ECG sensor, high quality Bluetooth, etc.–and developed a clever way to integrate all these into one stretchable device,” said Yang Li, a nanoengineering graduate student at UC San Diego. So far, the smart bandage can last for more than six months without any drop in performance, stretchability or flexibility. It can communicate wirelessly with a smartphone or laptop up to 10 meters away and runs on a total of about 35.6 milliwatts. The team plans to work with industrial partners to optimize and refine their design, along with testing it in clinical settings in the future. Researchers at MIT embedded high speed optoelectronic devices, both LEDs and diode photodetectors, within fibers that can be woven into soft, washable fabrics and made into communication systems. Typically, optical fibers are produced by making a preform, a cylindrical object which is essentially a scaled-up model of the fiber, then heating it. Softened material is then drawn or pulled downward under tension and the resulting fiber is collected on a spool. For the new fibers, diodes and a pair of thin copper wires were added to the preform. When heated in a furnace during the fiber-drawing process, the polymer preform partially liquified, forming a long fiber with the diodes lined up along its center and connected in parallel by the copper wires. The diodes ended up less than 20cm apart. 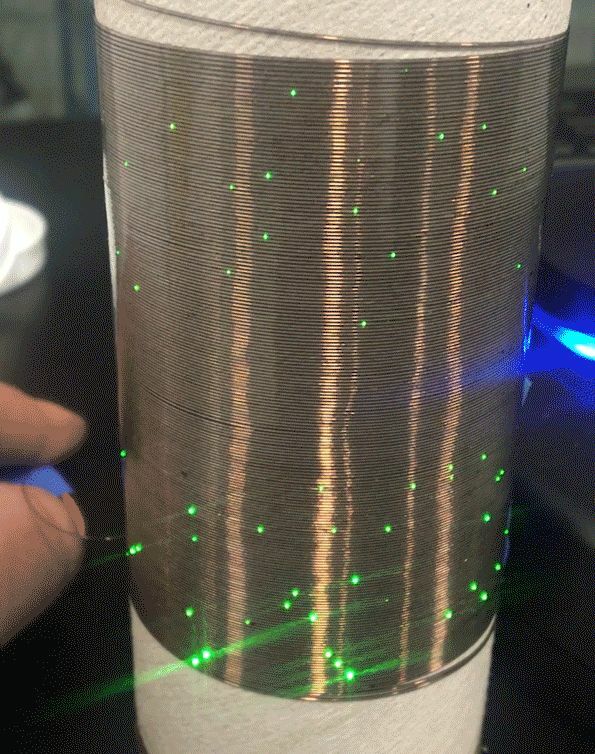 The diode fibers were able to maintain performance throughout ten machine-wash cycles. Additionally, by incorporating function into the fiber material itself, the resulting fiber is inherently waterproof. To demonstrate this, the team placed some of the photodetecting fibers inside a fish tank. A lamp outside the aquarium transmitted music through the water to the fibers in the form of rapid optical signals. The fibers in the tank converted the light pulses, which appear steady to the naked eye, to electrical signals, which were then converted into music. The fibers survived in the water for weeks. The first commercial products incorporating this technology will be reaching the marketplace as early as next year, said Yoel Fink, MIT professor of materials science and electrical engineering. These initial applications will be specialized products involving communications and safety. “It’s going to be the first fabric communication system. We are right now in the process of transitioning the technology to domestic manufacturers and industry at an unprecedented speed and scale.” The U.S. Department of Defense has also expressed interest in the fibers. Engineers at the University of Michigan developed a ceramic, solid-state electrolyte for lithium metal batteries. While lithium metal batteries have a much higher capacity than lithium-ion batteries, they are prone to poor durability and short-circuiting. The ceramic layer stabilizes the surface, keeping the metal filaments called dendrites from forming and preventing fires. It allows batteries to harness the density and conductivity benefits of lithium metal without the dangers of fires or degradation over time. In earlier solid state electrolyte tests, lithium metal grew through the ceramic electrolyte at low charging rates, causing a short circuit, much like that in liquid cells. The researchers solved this problem with chemical and mechanical treatments that provide a pristine surface for lithium to plate evenly, effectively suppressing the formation of dendrites or filaments. Not only does this improve safety, it enables a dramatic improvement in charging rates, according to Sakamoto. Notably, the battery showed no signs of degradation over 22 days of discharging and recharging. The team says that bulk solid state electrolytes enable cells that are a drop-in replacement for current lithium ion batteries and could leverage existing battery manufacturing technology. The group has begun producing thin solid electrolyte layers required to meet solid state capacity targets.